Yes, the questions we ALL want to know the real and honest answer to: why do flowers cost so much?! I hear this question all the time and see some couples making the mistake of taking this beast of a task head on- alone! There are a number of reasons to hire a florist, and it doesn't start and stop with experience (although this video alone should convince you to not DIY this step). So in order to get the details I needed to help educate my clients and continue offering them the best opportunities for fabulous wedding photos, I reached out to my friend Alyssa Lytle of Color Theory Collective. Here are the highlights from our FAQ. DO STYLE AND BUDGET GO HAND IN HAND? Yes. Just, yes. Resources like Pinterest and Instagram have opened up a world of ideas for clients. Unfortunately there is not a price tag attached to any of these amazing images to better inform our clients of what to expect. WHAT GOES INTO THE COST OF A WEDDING BOUQUET? There are generally 5 main costs contributing to a wedding bouquet: Blooms, Freight Shipping, Mechanics, Silk, and Time. BLOOMS: A bouquet is fairly dense to create its shape, so it does require a lot more floral than what some people expect! Florists also tend to order more flowers than absolutely necessary for the bouquet because flowers don't always come in as expected- variations of colors, stem length, stem curves, broken stems, shedding petals, etc. We've got our clients covered, but it is necessary that we account for these costs so we can be sure to provide our clients with a bouquet of premium blooms! SHIPPING: When ordering floral for an entire wedding shipping can cost several hundred dollars (or more). This has to be broken down into the cost of wedding floral throughout the quote or added as a separate line depending on how the florist does it. MECHANICS: Regarding the mechanics, I use a chicken wire "egg" to design the bouquet (this method/style originated from florist, Holly Chapple) and waterproof tape. These are minimal costs, but are certainly there for every bouquet. SILK: I generally finish my bouquets with plant dyed silk, which costs on average $18/yard and I use no less than 3 yards, but would prefer to use up to 6 yards! Thats $108 of silk (without markup) if you are loving the trailing silk look. TIME: Okay, this is a big one that a lot of people don't think of or realize until you've experienced it. If you are wanting an artfully designed bouquet from someone who takes great care of this design, we are talking HOURS for this one item. Upon receiving the floral, buckets are filled, boxes are opened, broken down, and every single stem is touched. Every stem that goes into a bridal bouquet is pruned of thorns, leaves, bruised petals, etc and this takes time. From there the bouquet design time can vary, usually several hours. IS IT TRUE THAT GREENERY IS CHEAPER THAN TRADITIONAL FLOWERS? Greenery is usually more cost effective when you are breaking the price down per stem. HOWEVER! That is usually meaningless because if a client loves greenery, they generally have a greenery garland in mind. That can cost between $20-$30 per foot and obviously prices can also vary from that depending on season and the type of greenery in the garland. If a client is going to have a guest count of 150 people, we are talking 19 8 ft tables. If you do the math, this is about $250 per table, and $4,500 for all the tables. This is not including any flowers in the garland, but just greenery. It is also not including the cascading look that is beautiful where the garland falls to the floor on each side. You can add an additional 8-10 feet per table for this look, meaning $540 per table. All of that said, no, not cheaper than traditional flowers! 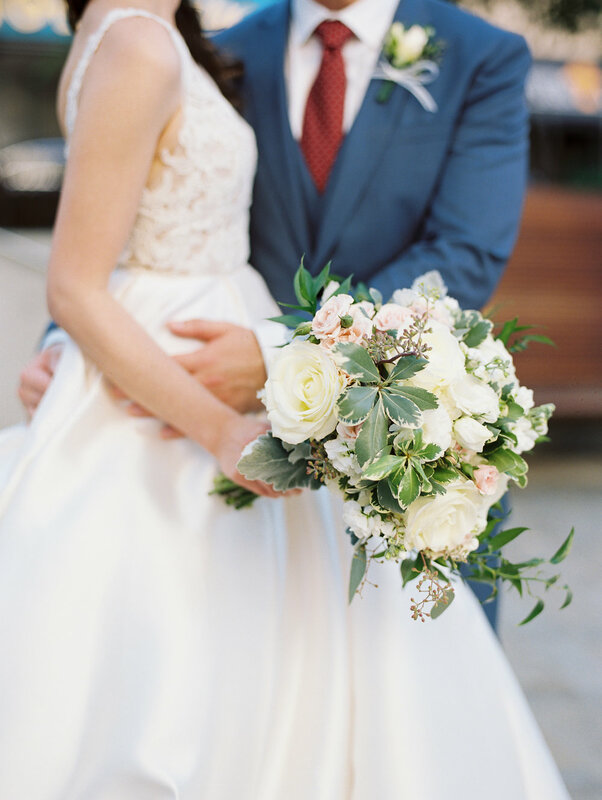 WHAT IS THE BEST WAY FOR A BRIDE TO GET A FULL BOUQUET WITHOUT GOING OVER BUDGET? I am glad you asked this because it does tend to be a misconception that bridal bouquet cost is going to put a client over on their budget. There is generally only one bridal bouquet in a wedding. Two at the most. If a group of people is getting married, I can see how the bridal bouquet costs could add up, but let's just say there are two people getting married. The bridal bouquet is one or two line items- just go big. Go amazing and beautiful. Cutting a bouquet $50 or even $100 is not going to make a big difference in your budget, but it will make a difference in the look of the bouquet. To answer this question, just cut your guest count down 10 people, drop a table, and have an amazing bouquet. WHAT IS A COST EFFICIENT ALTERNATIVE TO GARLAND WHILE STILL HAVING A BEAUTIFUL FLORAL DISPLAY? The saying "you get what you pay for" is very wise and very true. I have clients searching for the answer to this very question and end up realizing either they need to let go of the idea of a beautiful floral display or move some numbers around to make a bigger budget for flowers. Something I do love for an 8 ft guest table is the use of candles and floral frogs scattered down the length of the table. This ends up being fairly comparable to the cost of a greenery garland, but I feel it has more of an impact for the amount of money you are spending. I love the depth of movement designing in frogs can lend to, paired with the sparkle and modern elegance of tapered candles, rather than the flat feeling of laying a greenery garland on a table. Hopefully these Q&As help clarify some of the reasons flowers do cost so much and help you get a better understanding of the world of flowers!